The I-PACE, an electric sport utility vehicle (SUV) produced by British automotive company Jaguar Land Rover (JLR) under its Jaguar marque, made its global debut on Tuesday (local time) at the Geneva International Motor Show in Geneva, Switzerland. With its electrifying performance, supercar design, 480-kilometer range and rapid charging speed, Jaguar is seeking a revolution in the electric vehicle (EV) sector. The I-PACE has a 90-kilowatt hour lithium-ion battery and offers sportscar performance of 0 to 100 kilometers per hour in 4.8 seconds alongside the practicality of a 480-kilometer range and 0 percent to 80 percent charging time of 40 minutes, using a direct current 100kW rapid charger. The new all-electric I-PACE is the first Jaguar to incorporate the intuitive Touch Pro Duo, "Flight Deck" infotainment system, which uses an innovative combination of touchscreens, capacitive sensors and tactile physical controls to operate key functions. The Jaguar Smart Settings system also employs artificial intelligence (AI) to identify driver preferences and tailor the driving experience. "The I-PACE is the first Jaguar to use AI machine learning to create a better driving experience. By using technology to identify and automate some of the routine tasks that can distract or inconvenience the driver, Jaguar's first electric performance SUV will change the perception of how everyday driving should be," said Peter Virk, director of connected cars and future technology at JLR. The I-PACE was designed and engineered by JLR in the UK and the company will build the I-PACE in Austria as part of a manufacturing partnership with Magna Steyr, an automobile manufacturer based in Graz, Austria. The I-PACE joins Jaguar's growing family of SUVs, which includes the E-PACE and F-PACE. The concept version of I-PACE made its Asian debut at the Shanghai Auto Show in April 2017. The car is expected to hit the Chinese market in the second half of 2018. "The reaction to the I-PACE was unbelievably strong in China," Ralf Speth, CEO of JLR, told the Global Times on Tuesday. The I-PACE is a high-tech vehicle using the liberation of new technology, Speth said, noting that it will be a successful product in the Chinese market. "I'm convinced that electrification is going to come," as EVs are a good contribution to the environment and society, he said. The introduction of the I-PACE to China will help fill a gap in the Chinese luxury EV market, said Li Yanwei, who serves on the China Automobile Dealers Association Expert Committee. In China, the price for the BMW i3 electric car is about 300,000 yuan ($47,529), and Tesla also sells cars worth more than 800,000 yuan, Li told the Global Times on the sidelines of the auto show on Tuesday. Li noted that as there's a gap in the Chinese market, with few cars priced at 400,000 yuan to 800,000 yuan, it's possible that the price of the I-PACE would fall into that range. China was the biggest market for JLR in the world in 2017, according to Speth. He also noted that situation is set to continue because China itself is the world's largest automotive market. The Chinese luxury EV market has great growth potential and there are great opportunities for the I-PACE in China, experts said. Luxury EVs priced at more than 300,000 yuan only accounted for 6 percent of the Chinese market in 2017, up 1 percentage point from 2015, according to Li. Experts said that luxury car companies have an advantage in the EV segment thanks to prominent brands and better understanding of their customers. 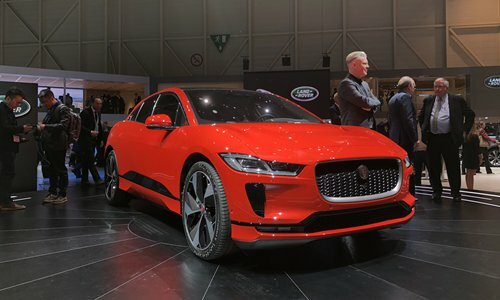 Although I-PACE has many advantages in the EV sector, Jaguar will have to become familiar with the demands of Chinese drivers if its SUV is to succeed in the market, Li said. The I-PACE may also face some competition from local EV producers such as start-up Nio, Li said. In December 2017, Nio launched its ES8 all-electric SUV with a price of 448,000 yuan. But Li said that Nio doesn't have the prestige of a luxury brand to drive sales. Also at the Geneva Motor Show, JLR revealed the world's first full-size luxury SUV coupe: the limited-edition two-door Range Rover SV Coupe.